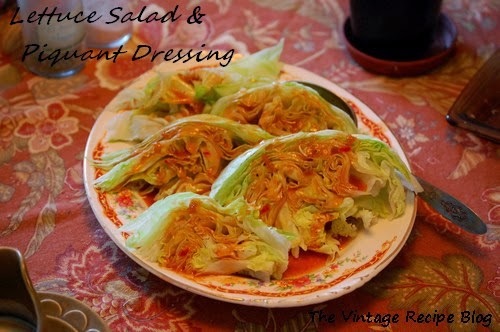 In this case I needed a simple "salad" to go with a luncheon meal I was making and in one of my old 1920's cookbooks it referenced a "Piquant Dressing" which the recipe was not included (of course). So it was off to the research again until I found a newspaper clipping from 1929 with this recipe. Now strictly speaking there are 2 types of piquant dressing. This one is based on the vinaigrette type French dressings that were popular in the 1920's the other type is based on Russian dressing and came about sometime in the 1930's. I mixed the ingredients together and stored it in a mason jar in the fridge and just give it a good shake before using. Combine ingredients and whisk well until combined and thickened. Serve on wedges of iceberg lettuce for a 1920's treat.